According to Transport Canada, approximately 60 bicyclists are killed each year in collisions with motor vehicles. This sobering statistic highlights the very real danger that cyclists face when peddling their bikes from place to place. Cycling is growing more popular in Canada by the day, so it's more important than ever for drivers and cyclists to learn how to share the road. Motorists often blame cyclists, and cyclists often blame motorists. At the end of the day, both parties are responsible for maintaining safety on the road. Learn more about how motorists and cyclists can share the road and the benefits of doing so. Which came first: the automobile or the bicycle? If roads were designed for cars, shouldn't drivers be in charge? Neither one of these points really matters. The fact is that bicycles aren't going anywhere, and there's obviously no way that cars are going to be banned. For both of these reasons, it is critical for cyclists and drivers to learn to share the road responsibly. Practicality is just the tip of the iceberg when it comes to the benefits of sharing the road. 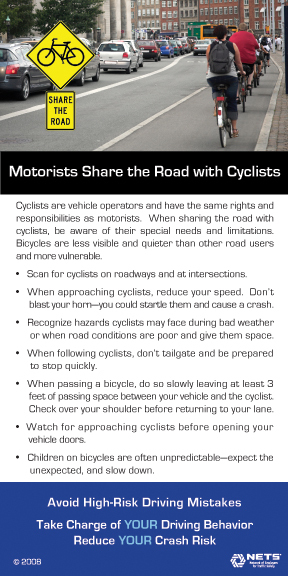 As a motorist, there's a lot you can do to enhance safety while sharing the road with cyclists. The following 10 tips will help you share the road more effectively. When leaving your driveway remember to watch for cyclists in addition to other motorists and pedestrians. Once on the road and you see a cyclist, imagine a buffer zone of three feet around all sides and steer clear of that buffer zone to give plenty of room. Only pass a cyclist when there's plenty of room to do so for both you and the cyclist, and don't honk; it could startle them and cause an accident. Don't drink and drive. A simple message that often gets overlooked making the roads more dangerous for everyone. Read our article on distracted driving for insights on how poor driving habits affect safety on the roads. If turning left, watch for approaching cyclists and err on the side of caution by waiting for them to leave the intersection-they may be travelling faster than you realize. Exercise extreme caution when turning right and watch for cyclists who may be to the right of your vehicle. Also watch for cyclists approaching from behind, check to see if they're signalling to turn as well. Always use your turn indicator. Be especially mindful of children on bicycles; they can be unpredictable. When street parking look carefully before opening your car door to get out. If in doubt, give the cyclist the right of way; it's simply safer for everyone involved. Remember, cyclists are equals and are legal road users with the same rights and responsibilities as drivers of vehicles. Did you know the accident rate among cyclists is 26 to 48 times higher than it is among motorists? It's important and sharing the road works both ways; if you're a cyclist, keep these tips in mind to be a safer rider. Learn important handling skills and safety maneuvers. There are online guides available, such as the Ontario's Cycling Skills Guide. Or if you prefer the more hands-on approach, attend courses taught by certified instructors that teach important skills so you're prepared to use them at a moment's notice. Make sure your bike is ready to ride; a bicycle that is in need of repair is also unsafe to ride. Always wear a helmet because it could save your life in the event of what may even appear as a minor accident. Be seen and heard by wearing brightly coloured clothing, having your bicycle equipped with lights and reflectors, and using your bell or horn as you approach pedestrians, other cyclists and intersections. At sunrise and sunset, and riding directly into or away from the sun leave yourself extra room. Ride in a straight line and always signal when planning to turn. Before turning, do a quick check over your shoulder to ensure it is safe to do so and signal your intention to turn. If you don't know the hand signal for turning (and stopping) learn them. At an intersection with an all way stop, the vehicle that arrives first has the right-of-way; if two arrive at the same time, then the vehicle to the right does. Don't drink and ride; you have the same rights and responsibilities as other vehicles on the road and this includes not riding impaired. Obey all of the rules of the road; a bicycle is technically a vehicle, so make sure to obey all traffic laws. It makes it easier for motorists to know what to expect too. In addition to the tips that are outlined above, there are ways to improve the existing infrastructure to promote safety between motorists and cyclists. One way to make this happen is by building "complete streets" which include bicycle lanes, designated lanes for mass transit vehicles and sidewalks for pedestrians. Streets like these will not only improve the flow of traffic but also improve safety for drivers, riders and pedestrians. In the meantime, watching out for motorists and cyclists is the best way to coexist peacefully with one another. GetInsuranceQuotes.ca is a free, fast and secure online service that offers consumers an easy way to find car insurance quotes from competing brokers and agents. All car insurance shoppers, regardless if they are searching for car insurance Ontario or car insurance Alberta, should consider using GetInsuranceQuotes.ca first. GetInsuranceQuotes Canada Ltd. is not an insurance provider. It is an online service that offers car insurance shoppers a means to find competitive auto insurance quotes from a network of car insurance brokers and agents within Ontario and Alberta of their participating intermediaries and providers. Auto Insurance QuotesIf you are ready to start saving money on your car insurance premium, you want to put the website for GetInsuranceQuotes.ca to work for you today. Type your postal code into the website now to start comparing competitive quotes for your new policy. High Risk Auto InsuranceIf you have been labeled a high risk driver by car insurance companies, you may feel as though you have no choice but to pay a fortune for car insurance. Contact the experienced brokers at GetInsuranceQuotes.ca today to learn how you can save money on an affordable car insurance policy. Mississauga Car InsuranceWhen you want to save money on your Mississauga car insurance in Ontario, you want to put GetInsuranceQuotes.ca to use. Our innovative service provides you with personalized quotes for car insurance within just a few minutes, making it easy to find a way to save money on coverage. Lethbridge Car Insurance RatesIf your car insurance rates are putting a crimp in your budget, GetInsuranceQuotes.ca can help. You can compare car insurance rates from top Canadian insurance providers today to see how much you can save money on your coverage. Red Deer Auto Insurance QuoteIf you are one of the drivers in Red Deer who think they may be paying too much on auto insurance, GetInsuranceQuotes.ca may be the right service you need today. Let us mobilize our team of car insurance brokers and agents to find you the best car insurance rates available. Edmonton Auto InsuranceThink you are overpaying on your auto insurance in Edmonton, Alberta? Use our free online service to shop around and compare quotes on car insurance. Our service is free and easy to use. Simply get started by filling out your driver details on our site and we'll connect you with a professional insurance agent or broker. Saving money on car insurance in Edmonton has never been easier. Car Insurance For Young DriversYoung drivers like you are struggling to find affordable car insurance rates in Canada. The dedicated team at GetInsuranceQuotes.ca can help young drivers shop for the lowest rates and save money on their premium. It Pays To Be A Good DriverAs a safe driver with a clean record, you know that you should be paying the lowest price for car insurance. If you are ready to look for more affordable rates for car insurance coverage, contact the team at GetInsuranceQuotes.ca for assistance today. Road Rage Driving HabitsYou may not realize it but speeding is a gateway to road rage. In addition, it can also lead to other unsafe driving habits that ultimately could result in higher insurance rates. If you want to learn more about how you can save money on your car insurance, contact GetInsuranceQuotes.ca today. Safest Cars In CanadaOne of the best ways that you can save money on your car insurance in Canada is to drive a car recognized to be among the safest. GetInsuranceQuotes.ca can help you to learn more about the affordability and safety rating of cars as you shop for your next vehicle. Auto Insurance Quotes AlbertaGetInsuranceQuotes.ca provides you with the best way to save money on your Alberta car insurance. We have a streamlined process that makes it easy to gather highly competitive rates so that you can find the lowest price possible on your coverage. Car Insurance North YorkWhen you need to find affordable North York car insurance, you want to use GetInsuranceQuotes.ca to compare rates. Many Ontario drivers like you have already discovered considerable savings available to them by using GetInsuranceQuotes.ca.